Fruitarians (or ‘fructarians’) are a subgroup of vegans, who are in turn a subgroup of vegetarians, most of whom adopt their particular dietary preference for reasons of health, ecological/environmental responsibility, or ethics. A Vegetarian diet excludes meat and fish, and products derived from them (such as cochineal, lard, tallow, gelatin), although it can include honey, milk and other dairy products, and eggs. A Vegan diet goes further by excluding dairy and egg products – only vegetables are eaten. A Fruitarian (fructarian) diet goes further again by excluding all parts of all ‘vegetables’ (that is, plants and trees) except the fruit of the plant. In a fruitarian diet, the only parts of plants used are the fruit, nuts, seeds and other plant matter that can be gathered without harming the plant. In other words, ‘culinary’ fruit (apples, oranges, pears etc) and ‘botanical’ fruit or seed-containing reproductive parts of flowering plants (beans, berries, capsicums, cucumbers, grains, nuts, peas, pumpkins, seeds, squash, tomatoes, and the like), can be eaten, but not carrots, potatoes or spinach etc., which require destruction of the plant. A true fruitarian believes that removal of a vegetable from its roots (say a potato or a lettuce leaf) injures it, which is against the fruitarian concept of causing no death or injury to anything in order to consume part of it (the tomato and avocado are considered either fruit or vegetable, and thus are exceptions to this rule). The fruitarian diet may appear to be limited in variety and in nutrition, but nuts of any type provide a protein source, and grains and pasta are suggested for a balanced diet. Eggs may also be eaten if from organically grown chickens. Diabetic or hypoglycemic-type symptoms, due to the high sugar content of the fruitarian diet, which also lacks protein, minerals, and fat-soluble vitamins. (“ortho” meaning straight, correct, and true), which has similarities to “anorexia nervosa”. Orthorexia nervosa refers to a pathological fixation on eating so-called ‘proper’ food. Look for healthy vegetarian and fruit recipes here. 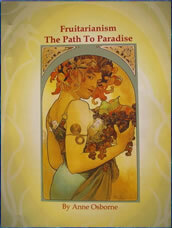 Fruitarianism: The path to paradise is written by Anne Osborne who is a long term fruitarian. For eighteen years Obsorne has eaten only fruit and has also raised her two children on a fruit diet. Osborne says that she wrote this book to share her personal experiences about a fruit diet and she claims that she does not profess to know which diet or lifestyle is the best for everyone. Osborne believes that the natural diet of humans is one based on fruit and supports her statements with comparative analysis charts that show how human anatomy relates to other species. Osborne says that when we live on fruit alone it is vitally important to eat the highest quality fruit. She believes that when fruit is of excellent quality it can give us everything we need in order for our bodies to be healthy. Osborne brings our attention to fruits high in calcium (figs and oranges) as well as those high in iron (prunes, watermelon, dates, raisins and apricots). She recognizes that a fruit diet may be low in minerals unless it consists of top quality, wild, organic fruits and berries. In these situations she says that the solution is either to improve the quality of the fruit or to add good quality green vegetables to the diet. She also believes that green vegetables can have a role in healing and well being and states that if you are attracted to them in their natural state, without salad dressing or other methods of preparation, then they are most likely a good food for you. Osborne recommends the use of avocados as a transitional food, in colder climates, as well as for those who are underweight. She does not recommend eating seeds because many of them contain chemicals that are poisonous to the human body. She believes our role is to eat the fruit and scatter the seeds so that a new tree can grow and provide us with nourishment. Fruitarianism includes chapters on raising fruitarian children, cleansing, juice fasting and sunlight as well as entire chapters devoted to many individual fruits. Osborne says that “exercise and a healthy diet are inseparable if we truly want to flourish”. She highlights the benefits of exercise to improve appetite, increase circulation, enhance the function of the lymphatic system and allow us to appreciate a better quality of life. Fruitarianism: The path to paradise is available on the author’s website for $27 AUD. Eating more than five serves of fruit a day is associated with a reduced risk of cancer. Fruit is easy to digest. Includes tips on how to select the best fruit. Most people will develop nutritional deficiencies on a fruitarian diet. Does not provide adequate protein or essential fats. Deficient in many important vitamins and minerals including vitamin B12, zinc and selenium. May be expensive to buy the large quantities of fruit that are required. Not very appealing in a cold climate. Book is not available in stores. Fruitarianism: The Path to Paradise provides unique information about fruit and the fruitarian diet and will appeal to those who are interested in raw food and cleansing diets. It is however vitally important for readers to be aware that it is extremely difficult to maintain health on a fruit diet as many essential nutrients are missing or in short supply. How ignorant can people get? Sure this may provide excellent results for weight loss, but c’mon a long-term fruit diet? Anyone who decides to live their life this way for the sake of not harming anything, is just making an excuse for an eating disorder. How ridiculous! oh i LOVE the fruit diet. i went on it for 30 days, and i had lost 10kg. for me, that was a huge acomplishment, as i didnt really have much weight to lose in the first place. but my eyes were clearer, skin was perfect and i was always happy. i always suggest it to people. and to add to all this, i didnt exercise at all while i was on it. so if i had exercised, i would have lost a lot more. i eat mainly fruit and some nuts. it is a deep seeded belief system that we do better on fruit; i know it has changed my self esteem from a 2 to an 8, it has improved aches and pains (there ARE none), it has improved my quality of life from a 2 to a 6, i enjoy people more than before, etc etc etc. maybe i have orthorexia, but it works for ME!!!! i’ll take it any day – over conventional food – if i can have the discipline to stay on it!!!! You know the fruit diet does work and it is not a sin not to eat meat once and a while if so then all of rome is sinning because easter is apon us. I took the fruit diet for one month and lost 25 lbs that stayed off. It works and my doctor is the one that told me about it. Friut will help you lose wieght if you need weight loss and if you are to underwieght it will help you gain back. to those who think that eating only fruit will cause a ‘protein deficiency’: The recommended daily intake of protein is 10% of daily caloric intake. Pretty much all fruits and vegetables have about 10% protein in them… and many have much more. Plus its the most efficient protein for our bodies, much more complete than animal products. On a side not, nearly every food we eat has enough protein anyway so its impossible to have a protein deficiency. Even if we only at rice we would still be getting 8% of our daily caloric intake from protein. Read the 80/10/10 book and get informed!! I started out over 3 months ago with a transitional detox. Vegan first week. Juicing and raw 2nd week. Master Cleanse, I succeeded religiously for 10 Days! In the last 2 1/2 months I have gone from primarily raw with 1 mini cooked vegan soup or meal a day, to about 70% raw fruits and vegetables. For the most part I feel fabulous! In my mid 50’s and feeling that these past 3 months have been a gift. I do not “should” on myself. I am still learning my reactions to food, how often I need to eat…and am still playing with this. I doubt if I will remain this strict. Cooler weather approaching I will probably do light cooked grain, millet or quoina, some soups or warmed vege burgers several times a week. I do eat sprouts daily and 2 slices of sprouted Ezekiel bread per week. trust your intuition, learn the signs of healthy detox (do not mistake aches and pains, or even mild fatigue for malise) and find a professional guide to assist you. I am learning more about my body and my relationship to food every day….some comments here ring true to me and I will pay attention and some will never speak to my condition. Do what works and retain an open mind and a trusting body. I decided to change my eating habits, to fruits, i am on day 8, can i eat a garden salad? I’m not a fruitatarian, nor do I plan to become one, I’m happy with my vegan diet. However, nathalie, PLEASE PLEASE PLEASE make an appointment to see your GP, If you think its ‘bad for my health.. but.. it’s not tht i care bout it’ then I think you may be slipping from a fruitatarian to somebody with an eating disorder. PLEASE make an appointment because if anything, your Dr. can help you make a nutritious fruitatarian diet for you! And to everyone who is doing it for a weight-loss diet, I don’t think that is motivating enough for you to keep it up, and if anything, could evolve to a eating disorder. However, to everyone whodoes it for spritual/ religious/ ethical beliefs, good on you for doing what you believe in! right now i’m recovering from a light form of bulimia.. and i certainly need to detox and to bring my skin in order..
Fruitarianism as well as Raw Veganism can be very helpful to your body but everyone is different. Some people experience too much weight loss, deficiencies and Diabetic like symptoms while others thrive perfectly. Everyone is different and we should all find what’s best for us. Common problems that arise with vegan/fruit diets are vitamin B12 deficiency. Usually vitamin B12 is derived from bacteria that we ingest from meat and dairy products. However these bacteria can also be derived from consuming dietary yeast (it has a cheesy flavor), aloe Vera or supplementation. Everyone is different and some individuals genetics have adapted to eating cooked foods and meat, while others do best on vegan foods and raw. Some people actually produce vitamin B12 in their guts so they never experience deficiencies. So again everyone is different and what may work wonderfully for you may have devastating effects on others. So in the beginning mankind were fruitarians, after Adam and Eve sinned God cursed the ground and told Adam that it would be harder for him to obtain food from it, so God expanded their diets to include more vegetables and grain (herb of the field). Humans continued this diet until after the Flood, when God told Noah that he could eat anything that moved. Scholars believe that this particular expansion to man’s diet was due to the destruction of vegetation caused by the flood. It was better for humans to eat anything verses die of starvation. I am a Christian and I’m also a fruitarian, I adopted this life style because God told me to, He said that I would die if I didn’t and I believe Him. Disease runs ramped in my family due to our diet and lifestyle choices. My Grandmother on my Mother’s side has diabetes and had a heart attack and stroke. My Grandmother on my Father’s side has Leukemia. My Grandfather on my Father’s side had numerous amounts of heart attacks throughout his life starting in his twenties and finally died a few years ago. My Uncle has Multiple Sclerosis, My father has diabetes and has had many heart attacks and strokes currently he’s on dialyses due to kidney failure (they both stop working), my mother has congestive heart failure and my sister has lupus, and various unexplained phenomena occurring in her body. So I can see how premature death would have been inevitable if I continued on the path that I was on. But like I said everyone is different so find what works for you and do it, you owe it to yourself. I’m so tired of people automatically assuming that vegetarians, and vegans and frutarians in particular, are going to suffer from calcium and protein deficiencies, as well as a reduced intake of Omega 3s. I wish they’d do their homework before displaying their ignorance for all the world to see. Nuts, seeds and dark green leafy vegetables are a far superior source of calcium than dairy products, and are more easily assimilated by the body too (the pasteurisation process that occurs in dairy products makes the calcium far more difficult for the body to absorb). Further, eating a pure diet of fruit, nuts and vegetables renders the blood more alkaline, and thus the body does not need to leech as much (if any) calcium from the bones to neutralise acidic levels (so, to spell it out, there might actually be a slightly reduced need for as much calcium when eating this kind of diet). As for the Omega 3 band wagon that everyone is one, well, the very best source is from vegetables (and even fruits). As good as the fish source is, generally, one eats one’s fish cooked, and the cooking process denatures (changes the molecular shape of) these particular fats. So in that instance, fish no longer becomes a good source (since your body cannot use the denatured fats effectively). Further, our oceans have almost been fished out, so in my (not so) humble opinion, it is irresponsible to get one’s Omega 3s from this source. If you eat a mix of avocado, raw corn on the cob, mixed nuts and seeds, olives and/or cold pressed vegetable oils, you’ll be getting more than enough Omega 3s. And a vegan and fruitarian diet provides all of this. And if you still feel you need extra, a daily table spoon of cold pressed flax seed oil is the best source ever. Right, and as for the protein argument, I have one thing to say: Silver backed gorillas eat only plants. And they’re mighty big mo-fos. Nuff said. What is the best strategy to manage omega 3 to 6 ratio when going vegan without overshooting on omega 6.
dont go this direction beyond one week at a time. i tried it before and no doubt i lose weight everyday, (because no matter how much fruits you eat, you’d never gain any weight at all) after going on for more than 2 weeks, my hair starts falling from lack of protein. on an upside, it does make your skin glow, complexion clearer but in a sense, you’d feel more tired and weak at the beginning. guess its all up to you, weighing the pros and the cons together. Hey im on it now…I love fruit !! so i eat it all the time anyway ..
Mohondas Gandhi was a fruitarian at the end of his life. But he ate meat for a brief period in his younger years, which he later regretted due to his beliefs. The idea is captivating and noble to me, but I’m too weak-willed to stick with it. I decided to just incorporate more fruits and nuts into my diet, not a bad thing. Omg everyone has there own opinion about this topic. Some think you can kill foods by pruducing them to eat and some think its silly. But don’t get all religious about it geez you cannot inflict your self religion onto another so dont even try it ! when i got diagnosed with something called GERD (gastro esophaegul reflux disease) i was forced to do this diet… not by choice i lost SO MUCH wieght… my skin was so clear… its not starving yourself… you grow accustom to it…and you can eat as much as you want…. your skin clears up SO MUCH…. your skin will glow… and it is a lot like the raw food diet which actually has been known to cure diseases. i love nuts, fruits, smoothies, i feel so healthy and great!!! ii wouldnt lie to you…. its hard at first but in the end you will be so satisfied with how you look!!! u really need to try this diet! i started doing it and im healthy!! Don’t listen to these wackjobs , jimmy. you keep right on stickin it to em! God intended us 2 eat. Eating good wholsome food, made by Him, equals food for your mind body and soul. He intended us 2 eat certain animals and others he intended 4 us 2 leave alone, and some he intended 4 us to befriend. Everything was made by God 4 us. Read the first 4 books of the bible it will tell u. Dont comment on something u guys dont know about. Way 2 go rc!!! People like Jimmy make me hate organized religion… is there seriously something in the bible that says, “Hey, make sure you kill and torture animals for food. I’ll be taking offense, otherwise. Love God.”? I really need a good detox, I’ve been binging for 4 days straight now and I feel so lousy and tired. I never knew their was such think as a fruitarian =) Guess you learn something new everyday.. I have a question though, can you actually gain weight if you eat too much fruit? i make my fruit salads and also it’s helps me to losing weight and it’s my lifestyle weight. It’s that simple. TRY IT! If you didn’t … don’t comment on the above! ALL THE REASON NOT TO EAT THEM! and when you finally get god’s number, will you call and ask him what my middle finger looks like? Two days ago, I decided to eat mostly fruit. How much supplements do I need in dairy products, eggs, vegetables per week, and/or vitamins so I don’t get sick. Don’t forget that sprouts, which are dense nutritionally, may be eaten, and this includes breads made from sprouts. For instance I eat a sprouted rye bread made by Earth Seed, that has two ingredients: sprouted rye and purified water. It was baked at very low temperatures, and is organic. Also, the definition above is not one used by every fruitarian. Read Hereward Carrington’s book titled Fruitarian Diet, written around 1910, certainly did not advocate pasta, a processed, denatured food, as part of a fruitarian diet, because it harms human beings.